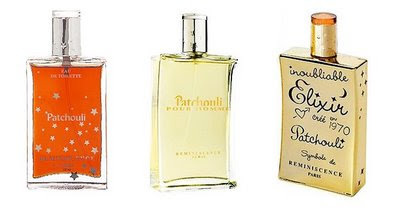 As a student of the Nature's Nexus Academy of Perfuming Arts, I am learning more and more about perfumery as an accomplished craft than perhaps I'd first imagined. Studying the complexities of the perfuming process from inception to completion has really left me feeling somewhat overwhelmed, but also with a greater appreciation of the art. 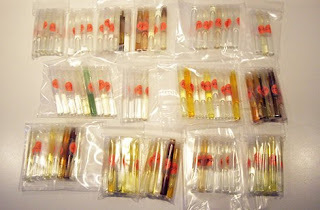 My individual evaluations of oils in my perfumer's palette alone has enabled me to recognise and appreciate individual accords and the olfactory qualities that can be attributed to each of them. With around 100 diluted absolutes to analyze, I have my work cut out for me before I even begin to attempt to mix a scent of my own... the theory and safety information alone have kept my nose buried in books, before even a solitary sniff of the air could be had. I've decided to post a brief evaluation of certain individual essences from time to time with you, the reader. Of course they are my own observations, but in doing so, I hope to be able to impart just a little more information about the properties of an oil, and how I feel it can be well applied and interpreted in perfumery. I will begin with scents that interest, challenge or move me in some way, but invite you to request individual essences you might like to learn of, (if indeed it is in my palette). Just leave a comment if you'd like me to examine a particular accord. If the truth be known, king of French fashion chic Karl Lagerfeld has always unsettled me with his appearance. There's something about that shock of white ponytailed hair, his caramel coloured perma-tan, and fingerless leather gloves that seemed somehow incongruous with a man in his 70's... not to speak of his mystifying black shades à la Michael Jackson - but despite the veneer, the man is a fashion genius. In his sensational career, Lagerfeld has worked with the greats: Chanel, Balmain, Cholé and Patou, but his present fame has been achieved with his freelance career and numerous couture and ready-to-wear collections that carry his own name. 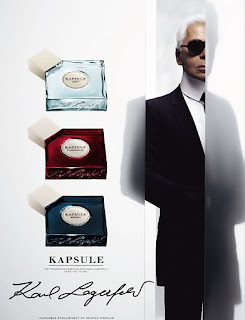 In 2008, Lagerfeld teamed up with several accomplished noses to create a new trio of unisex perfumes in his contemporary Kapsule range: Light, Floriental and Woody. A series of scents designed to carry you from daybreak to well after dark; I was particularly charmed by the intriguing Olivier Cresp creation: Woody... a fragrance that bestrides the line between genders and summons one to explore further. 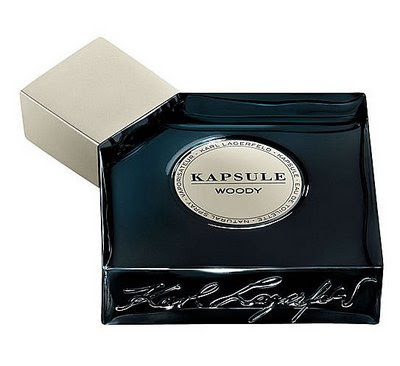 Woody is built around notes of dry cedar and dark mosses - each of which lend an earthy masculine charm, but tendrils of climbing green ivy and bushels of velvety violets disclose a softer, tender heart. When I close my eyes and inhale, I see with my mind's eye; dark cypress-green hues and rich purples. There is a semi-gourmand aspect to Woody that I attribute to a lush and narcotising plum accord - one that is not too saccharine, but lends an opulent nectar-like quality to the formulation. As it evaporates from the skin over an impressive 8 or 9 hours, Woody shifts recurrently. 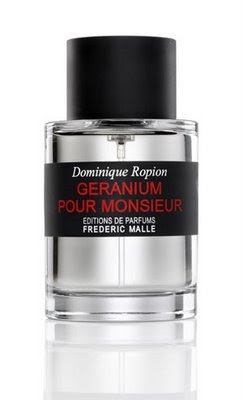 The fragrance unfurls unhurriedly, and at times, reminds me of Armani Privé's Cuir Amethyste, or the wonderful dry black tea-like accords distinguishable in Burberry's London for men. 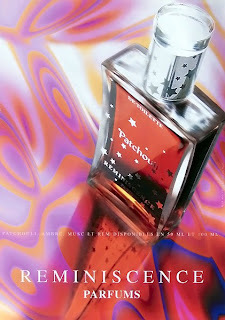 I am excited with this release as not only does it bring something new to the mainstream by way of a unisex woody scent; but also because it is unpretentious and surprising.